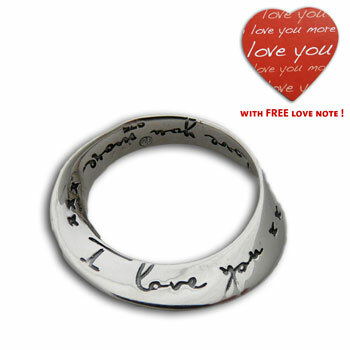 Gorgeous I love you more pendant is great for men or women. Mobius shaped pendant with the words, "I love you, I love you more" written on it. Comes with FREE heart-shaped love note card (limited to stock on hand). Optional Heart-Shaped gift bag that fits the card and jewelry perfectly. You can hang the gift bag on a tree, bunch of flowers or a bottle of champagne. You can put it on your own necklace or purchase one of our ours to make an I Love you Necklace! Perfect gift for anniversaries, Valentine's day, Mother's Day or just to tell some one how much you care. The moebius strip or mobius band is like a circle or ring made from a flat line with a twist in it. It is a unique mathematical object in that if you start in one place and move along the surface, you eventually end up back in the same place having traversed every part of the strip without crossing an edge. 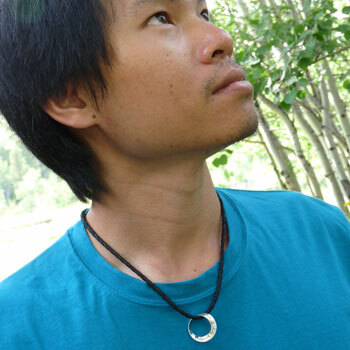 Using the moebius for this pendant with I love you I love you more written on the surface, symbolizes eternal never-ending and growing love as it repeats around the charm. Groovy little heart charm with the word "Love" written on it. This tiny heart pendant has a spring claps on it so it can be easily added to your favorite charm bracelet, necklace or anklet to make your own heart jewelry. Lovely handmade heart bag envelope is a perfect packaging for jewelry. It has a handy hanging loop so you can hang it from a flower, bottle of wine, or Christmas tree. Ideal for Valentine's Day, anniversaries, or any special occasion you'd like to show your love.